The miracle of the renewal of human life takes place in well-defined stages, from the union of the egg and sperm to the birth of the baby. Fetal development is the longest and clinically the most important phase of this process. Early human development may be summarized by the following four phases: (1) fertilization; (2) implantation; (3) gastrulation; and (4) embryogenesis. Fertilization. This stage takes place during the first week of human embryology . Fertilization occurs when the cell membrane of a sperm fuses with the cell membrane of the oocyte (egg), injecting its nucleus . The egg then undergoes its second division of meiosis , and the resulting haploid nucleus fuses with the haploid sperm nucleus to re-form the diploid number of chromosomes . These events occur in the oviduct, or fallopian tube. The fertilized egg, now termed a "zygote," continues to move down the oviduct to the uterus, where it lodges in the wall. Implantation. After the conceptus is implanted in the uterine wall, the cells that will form the embryo proper divide and organize themselves into a bilaminar (two-layered) disc. This disc is surrounded by an outer ring of cells, the trophoblast, which does not contribute to the new organism's tissues. After implantation, trophoblast cells multiply rapidly and invade the endometrium (uterine wall). Together, the trophoblast and endometrium form the placenta, through which all the nutrition for the developing embryo will pass. This rich mass of tissue is filled with blood vessels, allowing rapid exchange of nutrients and waste. Another group of cells separates from the developing embryo near this time, and these cells also do not form part of the new organism. Instead, they develop into the amnion, the membrane that will surround the fetus to form the embryonic sac. This fluid-filled sac helps to cushion the fetus during later development. This phase begins during the second week of development. Gastrulation. During the third week, the embryo undergoes the process of gastrulation, forming a trilaminar (three-layered) disc. Gastrulation establishes the three germ layers—the endoderm, ectoderm, and centrally placed mesoderm—all of which will give rise to the various organ systems. Mesoderm also combines with trophoblast tissue to form the umbilical cord, which transports nutrients and wastes between the fetal circulation and the placenta. Embryogenesis. At this point, the developing human enters the actual embryonic phase, which lasts from the third week through the eighth week after conception. The organ systems differentiate at greatly varying rates during this phase. For example, the circulatory system is largely functional at the end of this period, whereas the nervous system is still engaged in massive cell division and only beginning to establish functional connections. Most embryological malformations occur during this embryonic phase. The remainder of human development, from weeks nine to thirty-eight, is called the fetal period, the time during which the embryo first acquires human appearance. (The medical definition of the fetal period extends to forty weeks because it is measured not from conception but from the onset of the woman's last menstrual period, usually two weeks earlier.) Fertilization takes place around the middle of the average four-week cycle, hence the two week discrepancy between the biological and medical gestation period. A human fetus at ten weeks. The fetal period is characterized by two processes. The first is rapid growth (increase in size and cell number) and the second is continued tissue and organ differentiation (specialization of cells to perform distinct functions). Rapid growth. Fetal growth rate is greatest at the beginning of the fetal period (through week sixteen), during which time the fetus increases twenty-five-fold in weight. The largest increase in absolute weight gain, however, takes place during the final month of gestation. In these four weeks the fetus gains as much weight (500 grams [a little over 1 pound]) as it does during its first twenty weeks of development. Normal full-term babies weigh about 3,500 grams (7.7 pounds). Newborns weighing 500 grams or less rarely survive, although medical advances are improving their chances. Infants weighing between 500 and 1,000 grams (2.2 pounds) are classified as immature and those between 1,000 and 2,500 grams (5.5pounds) are premature. Besides weight, the length of the fetus is also used to estimate age and survivability. Specifically, the obstetrician can use ultrasonic probes to determine fetal crown-rump length, the distance from the top of the head to the bottom of the rump. Many factors affect fetal growth, including the nutritional state and social habits (e.g., smoking, drug use) of the mother, the state of placental function, and the genetic makeup of the fetus. Perinatology is the medical subspecialty concerned with the mother and fetus from the time of viability outside the uterus, generally the last three months of normal gestation (the third trimester) to about one month after birth. A perinatologist uses a variety of methods to assess the fetus. Amniocentesis is the technique by which amniotic fluid is withdrawn by a needle inserted through the mother's abdomen into the amniotic sac. The fluid itself can be analyzed for various metabolites , and fetal cells that have been shed into the fluid can be isolated and grown in culture for chromosomal analysis . The fetus itself can be visualized by two general methods. Ultra-sonography is noninvasive. 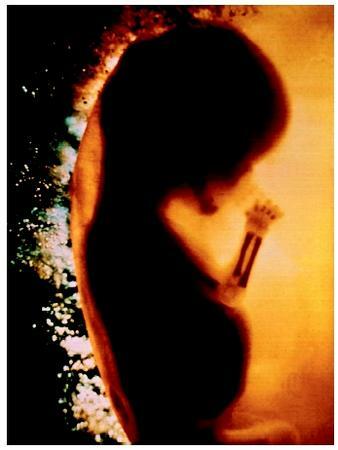 An instrument emitting ultrasonic waves is placed on the mother's abdomen and the reflected signals are rendered into images of the fetus by computer enhancement. Fetoscopy is an invasive technique in which a fiber-optic probe is inserted like an amniocentesis needle into the amnion. Fetoscopy can be used to both directly visualize the fetus and take a sample (biopsy) of specific fetal tissues. Tissue and organ development. Early in fetal development the head dominates the body, constituting half its length. The face is broad and flat, eyes are still wide apart, and ears are low. The intestines temporarily protrude through the abdominal wall until the tenth week, and the external genitalia appear similar between the sexes. The fetus also starts to excrete urine into the amniotic cavity. By the end of the fourth month, the rest of the body has caught up to the head and the limbs have grown to give the fetus proportions more nearly like those of a newborn. The fifth month is marked by the first fetal movements perceived by the mother, known as quickening. The skin of the fetus secretes a lipid -rich covering substance, the vernix caseosa. It also exhibits a temporary covering of fine hair, the lanugo. By the sixth month, the fetus acquires the capacity for independent existence because the lungs have finally matured to the point where the fetus can breathe. This depends on the secretion from specific lung cells of a protein -lipid complex known as surfactant. Surfactant lowers the surface tension in the lungs at the air-liquid interface thereby aiding gas exchange. Without adequate surfactant, infants born prematurely succumb to hyaline membrane disease (respiratory distress syndrome). Modern medicine has had some success in saving such babies by providing them with an external source of surfactant. During the seventh month the nervous system develops many basic reflex responses, including the constriction of the pupils in response to light. Other reflexes controlling breathing, swallowing, and general movement can be detected much earlier, around the middle of the third month, although the effective coordination of such movements requires several more months in utero . The cardiovascular system undergoes dramatic changes at the time of birth. Because the placenta provides for gaseous exchange in utero, blood flow to the lungs is largely bypassed through a hole known as the foramen ovale within the wall between the left and right atria . In addition, a shunt (bypass) called the ductus arteriosus occurs between the aorta and pulmonary artery. Upon birth, the foramen ovale is functionally closed by the higher blood pressure on the left side of the heart. This is in part caused by the closure of the ductus arteriosus, which becomes a fibrous remnant, the ligamentum arteriosum. The umbilical arteries and vein also degenerate after birth to become ligamentous structures on the inside of the abdominal wall. As the fetus approaches term, substantial adipose (fat) tissue is deposited. The circumference of the abdomen slightly exceeds that of the head. Passage of the head through the birth canal is facilitated by the fact that the flat bones of the skull are widely separated by connective tissue called fontanelles. This allows a degree of compression of the head at birth, called molding. The often misshapen head of the newborn quickly returns to normal. The process of birth, or parturition (labor), occurs in three stages. The first is the dilation of the cervix, the second is the actual delivery of the fetus, and the third ends with the expulsion of the placenta. The entire process may take from only a few hours to well over a day to complete. Kolata, Gina. The Baby Doctors: Probing the Limits of Fetal Medicine. New York: Delcorte Press, 1990. Lagercrantz, H., and T. A. Slotkin. "The 'Stress' of Being Born." Scientific American (April 1986): 100–107. Mehren, Elizabeth. Born Too Soon. New York: Kensington Books, 1991. Van De Graaf, Kent. Human Anatomy, 5th ed. New York: McGraw-Hill, 2000. Personally, I find it ok. I keep reding information on pregnancy, I want to find information with graphics, colour photos of the fetus at every week or month. I like looking at photos. I'm pregnant so it's just some light reading for me, prehaps some usefull information. Something that is not in any other form of litriture. but im waiting to hear my baby's heart beat. I'm 16 weeks on 07.04.08.